Regular visitors to Thailand know it to be a devoutly Buddhist nation - the glittering temples and colourful festivals are testament to this. But scratch beneath the surface and you'll find traditions and beliefs that pre-date even Buddhism customs that still play their part in the everyday lives of people around the country. 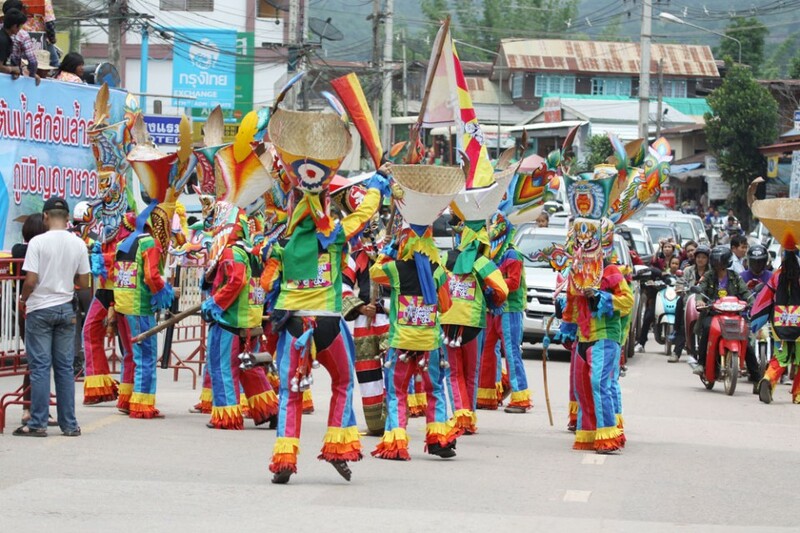 One of the most distinctive of these ancient traditions is the festival of Phi Ta Khon, which takes place every year between March and July in the Dan Sai district of Loei. 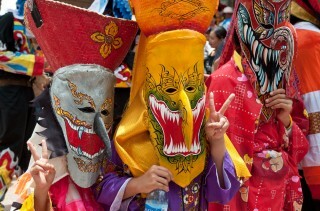 Sometimes called 'The Ghost Festival', the event is known for its cavalcade of locals dressed in distinctive and wildly colourful masks and headgear. 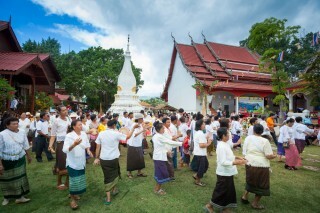 Revellers head for the local Wat Pho Chai Temple, accompanied by bells, music and laughter. Along the route, the masked and merry pranksters dash into the crowd, teasing blushing maidens and frightening and thrilling the children. 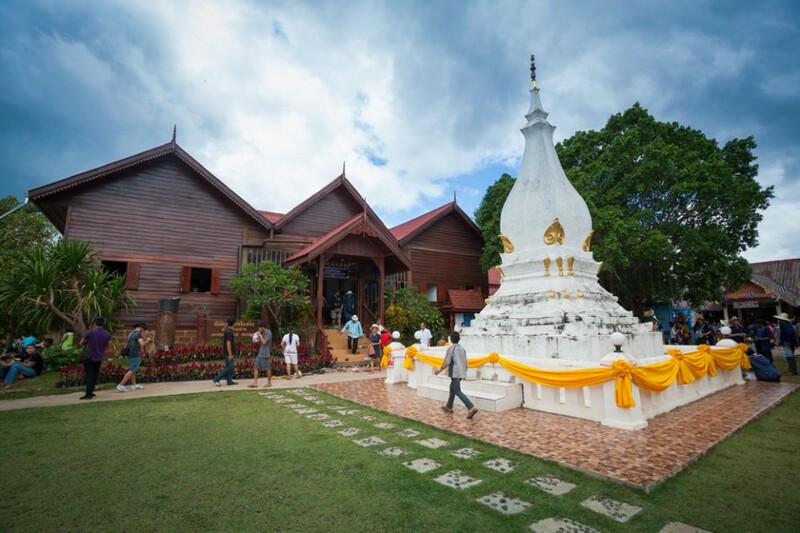 It's all great fun and one of Loei's biggest draws for visitors seeking a little taste of 'Thainess' off the kingdom's better-known travel paths. Phi Ta Khon is just one element in a three-day event called Bun Phawet. On the first day, the people of the district seek protection from the spirits of Phra u-Pakut, believed to live in the nearby Mun River. The parades take place on the second day with the final day being given up to Buddhist sermons on Vessantara Jatarka a popular morality tale about the Buddha's final incarnations as the charitable King Vessantara. This is why Phi Ta Khon is seen as a Buddhist celebration where locals make merit. But the rites, processions and costumes on display also evoke fertility festivals and hark back to times when people would appease local gods and spirits to ensure a good harvest. In a region such as Loei, where agriculture is the mainstay of the economy, the fertility of the soil and favourable weather is crucial, especially in June and July when the allimportant rice crop is being planted. 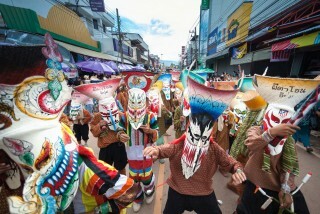 At first of course, it's the colourful masks of the Phi Ta Khon revellers that draw the eye. Impressive, vivid and fierce, the masks are made from shaped rice husk which has been elaborately painted and decorated with grinning, shark-toothed mouths and long, elaborately carved and curved noses. 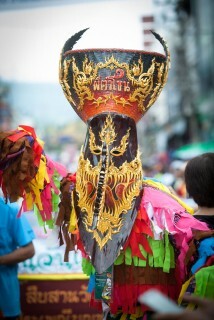 To make the characters appear larger than life, the masks are topped with wickerwork (usually a sticky rice steamer) painted in the same vibrant colours, or finished with an intricate piece of art. The ghosts' clothes are made up of tasselled rags and their belts are hung with bells, which add to the theatrics and rhythms of the parade. 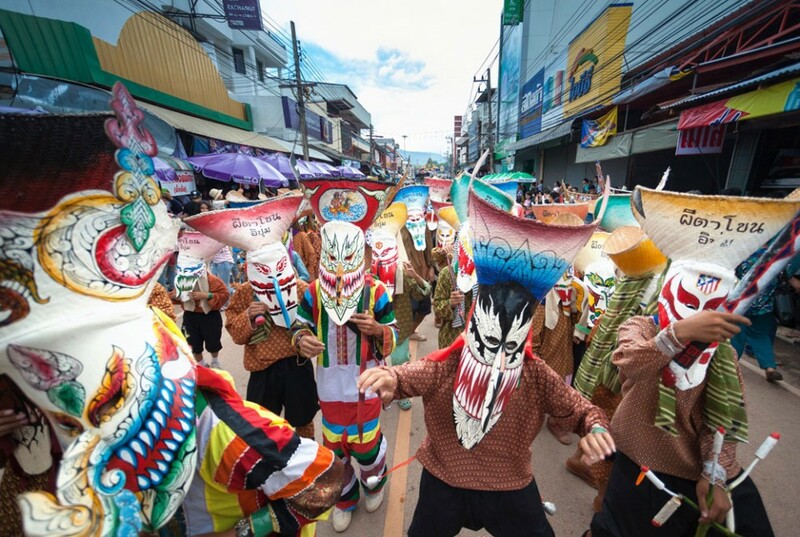 But when you look beyond the mask you'll see how the Phi Ta Khon celebrations are all about paying homage to the spirits of nature and the countryside. Among the standout groups are staff-carrying farmers, not wearing masks, but smeared from head-to-toe in fresh dripping, fertile mud and clearly enjoying every minute of it as people flee from their sticky embrace. Alongside these representations of life-giving soil are wicker models of the traditional beasts of Thai agriculture buffalos. These are 'ridden' through the procession in front of ploughs which have been hoisted onto wheels to trundle down the roads. But it's that most obvious symbol of fertility, the phallus, (known as Bhalad Khik) that stands out. In the procession they are represented in all shapes, sizes and often vivid colours, brandished like weapons by adult 'ghosts' and in some cases, even fired from guns, dangled from fishing poles or captured in nets. 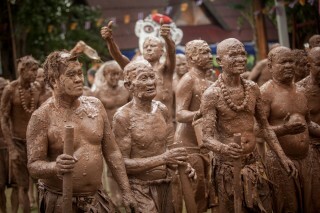 It's good bawdy fun and links the Phi Ta Khon festival with similar rites found in ancient rural societies the world over. Anyone with an interest in culture or anthropology will be glad to see that modern prudery hasn't wiped out these phallic displays in this lovely region of Loei. 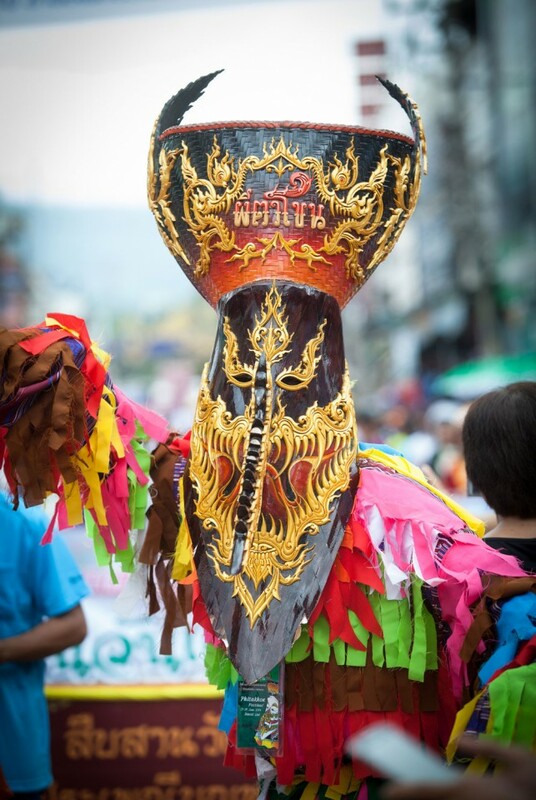 The Phi Ta Khon festival has grown considerably over recent years but hasn't lost any of its spirit. The performers seem to appreciate the bigger audience and ham it up all the more, posing for selfies and competing with bigger and better costumes. And whether you regard it as a Buddhist ceremony, a pagan fertility procession or simply a fun and colourful festival, Phi Ta Khon is a wonderful way to enjoy a uniquely Thai phenomenon in an area of the kingdom that is ripe for further cultural exploration.